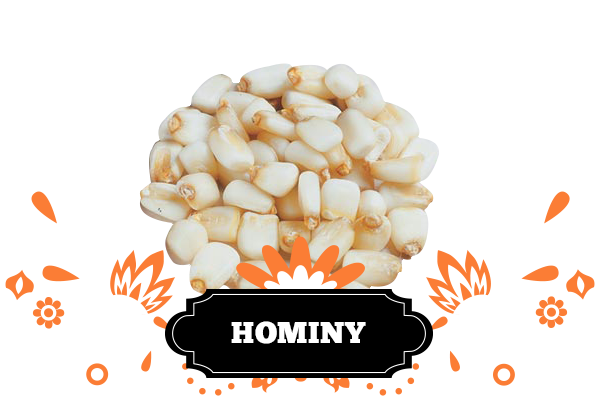 Hominy is dried corn that has been soaked in a mineral lime bath. This alkali process, known as nixtamalization, loosens the hulls from the kernels. It also softens the kernels themselves. The process can cause the kernels to double in size and become big, puffy and soft. The alkaline process the corn undergoes means it won’t sprout when stored and it makes it so that the nutrient niacin, found in corn, can be absorbed by the digestive tract better, making it more nutritious! Ground versions has many other uses in Mexico. It can, for instance, be mixed with water and milk to make the beverage atole, which is sometimes flavoured with chocolate. Hominy is also finely ground to make masa. Fresh masa that has been dried and powdered is called masa harina. Some of the corn oil breaks down into emulsifying agents, and helps the bonding the corn proteins to each other. Cornmeal from untreated ground corn can’t form a dough with the addition of water, but the chemical changes in masa make dough formation possible. 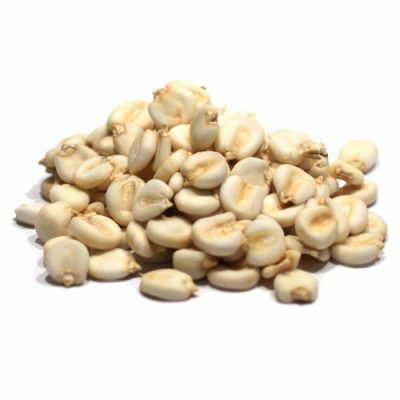 Hominy has also been produced in Mesoamerica since circa 1500 BC. This means it’s a tried and true method and a tradition that has been passed on through generations. The treatment however was very important as humans can’t absorb niacin in untreated corn. This would cause a niacin deficiency or pellagra in people. This would cause inflamed skins among others things! The soaking process frees niacin so once the masa is eaten, the intestines can absorb the niacin! This was discovered by exploring why the Mexican people who would eat corn products did not develop pellagra – it was simply a matter of a different processing technique! The Mayans would treat the corn in an alkaline solution to soften it, in the process we now call nixtamalization. Add Hominy to your dishes next time, for a rich and healthy alternative!